The TMNT are preparing to go on a mission in the city of Springfield, Massachusetts. Donatello bows out of the exercise so he can debug his latest project, and thus Splinter sends the three remaining Turtles to the city. Their goal: find Casey Jones and return to Northampton before 1 AM. April drives the guys to town and drops them off – if they can’t find Casey and get him to take them back home, they’ll have to walk… all 20 miles. Raph comes up with a plan – “an immobile object is easier to find than a mobile one,” thus the TMNT decide to find Casey’s car so they won’t risk missing him. Afterall, Casey can’t get back to town without his wheels. So the Mutant Ts head off to find Jones’ Chevy. Meanwhile, Casey is spying on the guys and heads off in the opposite direction. He enters a playground where he’s accousted by three young punks, who insist he pay a toll. A fight breaks out and Jones accidentally kills one of the boys. 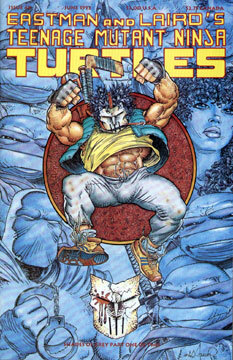 From the rooftops, we see the costumed clad vigilante Nobody (from Tales of the TMNT #2). Nobody, although being an ally of the Turtles, doesn’t know who Casey is, and attacks Jones for commiting the crime of homicide. A battle takes place, and Nobody tries to handcuff Casey and take him in. The Turtles spot the two remaining hoods fleeing and figure that the boys must have run into Casey, so they doubleback. The TMNT arrive in time to prevent Nobody from taking Jones to the police, but the crime fighter is angered by the situation. “You realize this makes you accomplishes.” the costumed cop states. “Casey will answer for whatever he is guilty of. Justice will be served.” Raph replies.